Let Walker & Dunlop help turn your dream and plans into reality–for even the most complex deals. 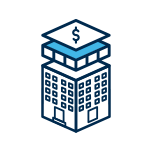 For capitalization beyond debt financing loans, Walker & Dunlop’s Structured Finance Group connects you to all options in the capital stack: joint venture equity, bridge and preferred equity, mezzanine financing, platform or operating company investments, development/construction financing, and beyond. We are unique in that we can do this through a dedicated national program, with experts in every product type–including multifamily, office, industrial, retail, student housing, senior housing, and hospitality–and an investor network that extends throughout the U.S. and across the globe. Walker & Dunlop’s Structured Finance Group knows what to look for and how to get things done, even for the most complex deals. Collectively, we have closed over $72 billion in transactions throughout our careers. Many of us have been on the principal side of the business as well, providing an uncommonly vivid perspective on what works with respect to structure and deal terms. Consider Walker & Dunlop a matchmaker for real estate developers, owners, and capital sources. Our work in 29 offices nationwide has yielded strong relationships with a range of capital providers: institutional funds, pension fund advisors, life insurance companies, real estate private equity firms, REITs, foreign capital sources, family offices, registered investment advisors, and high net worth individuals. This breadth of deals and markets adds up to better terms, savings, and value for you. Rather than reactively scramble to find capital when an opportunity arises, or rely on the same parties transaction after transaction, Walker & Dunlop takes a proactive approach to structured finance and equity placement. We meet with capital providers and real estate owners year-round to ascertain their interests, needs, deals on the table, and opportunities on the horizon. This means we are always ready with an ever-wider array of capital, sources, deal terms, and financing options for your next big project. Walker & Dunlop’s Structured Finance Group knows what to look for and how to get things done, for even the most complex deals.